Artifact collecting is a favorite activity of many people in Pennsylvania and one that has been taking place for over a hundred years. 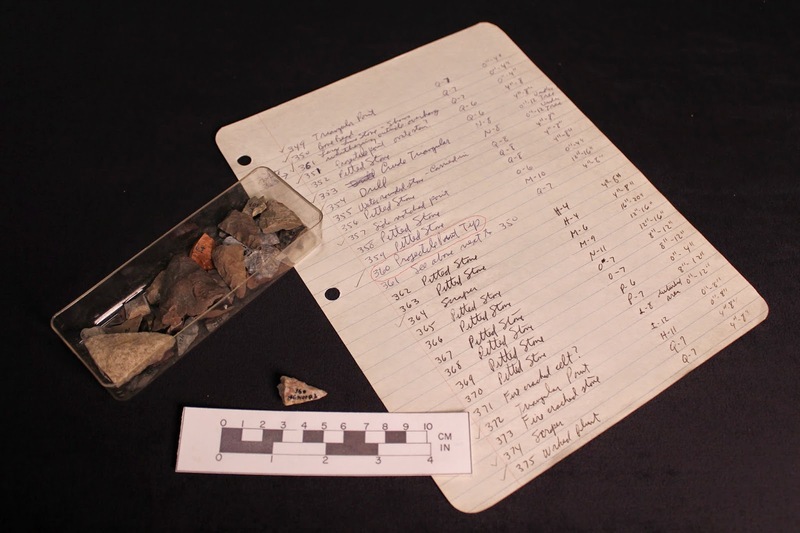 Evidence of early collecting can be seen in the large assemblages of Civil War artifacts collected immediately following the retreat of troops from the Gettysburg Battlefield and in the cases of projectile points recovered from cornfields along the Susquehanna River in the early 1900s. 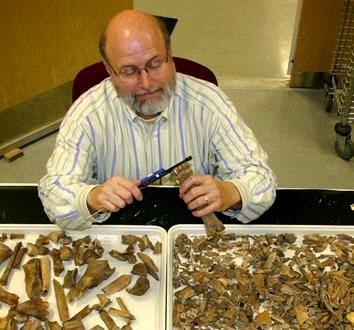 These collections often represent the remains of previously unknown sites that could provide important information to the history and prehistory of Pennsylvania. Collecting artifacts and digging sites are activities that are destructive by nature and are often undertaken by those who are not trained as professional archaeologists. In this way, important information on these sites is lost forever. Museums and professional archaeologists often rely on the collections and observations of avocational archaeologists to help with the understanding of local and regional settlement patterns. It is important to keep documentation on your site if you feel you must collect or dig on it. Remember that the more information you can provide on specifics of site location and types of artifacts recovered, the greater our knowledge will be of how and why human settlements changed over time. This is especially important for sites in areas that may be destroyed by development or natural disasters. Site documentation can range from simply noting locations on a map to keeping detailed field notes, mapping site boundaries and features, and taking photographs of important site characteristics. Handheld, mobile phones and Global Positioning Units (GPS) make finding and mapping site and artifact locations simple. An easy way for you to assist the professionals is to record your site promptly by completing a Pennsylvania Archaeological Site Survey (PASS) form. 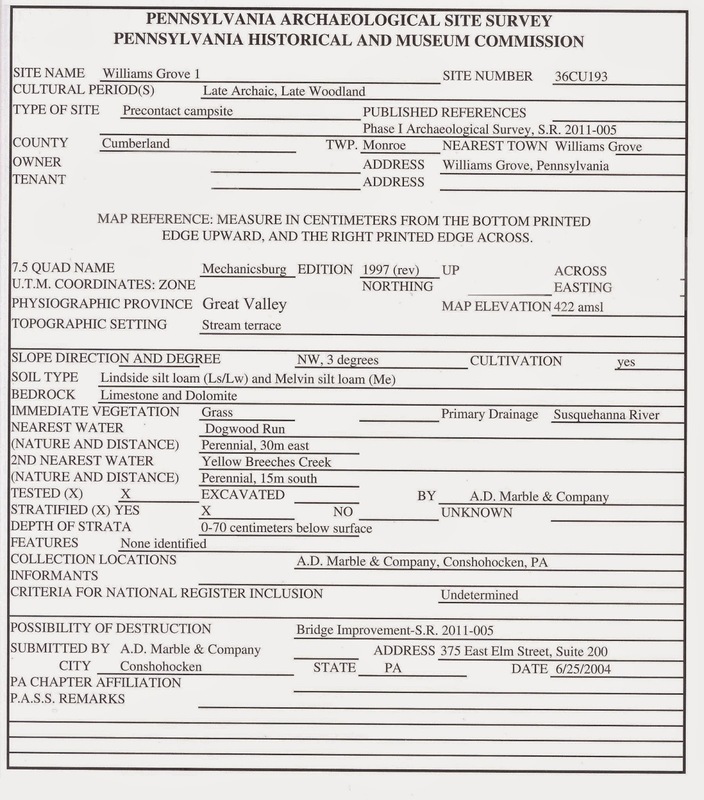 Provide as much information as you can on the PASS form and the site will be given a trinomial designation and added to the compiled spatial data for the state. This information is used by qualified professional archaeologists but is kept confidential from the general public so that sites are not destroyed. Cataloging the artifacts recovered from sites and recording their location is also an important part of the process. Designate a letter or number code to place on each artifact and key it to a list describing the type of artifact, material, and age if possible. Even if you are not sure how to identify your artifact properly, keying your finds to a map will allow researchers to determine spatial patterning at the site. So, what happens if you decide you no longer want your collection or that you would rather share it for the research potential it may represent? Many people choose to donate their collections to the State Museum, providing significant research opportunities to future generations. Donations may be as large as several thousand artifacts or as small as one unique item, such as the unusual hafted maul recovered in the City of Harrisburg. A collection is not only the artifacts you’ve collected, but also the documentation. Documentation includes notes, maps, and catalogs as well as photos of the field work and the artifacts if you have them. A signed Deed-of-Gift form indicating your intentions of donating a collection to the museum must accompany the artifacts. A new exhibit in the Archaeology Gallery on the second floor of the State Museum will showcase much of the information included in this blog. Please stop in soon to see it! More information on recording sites, cataloging artifacts, and donating collections can be found at http://www.portal.state.pa.us/portal/server.pt/community/recording_resources/3683. Silicate minerals make up approximately 90% of the debris in the earth’s 40 plus kilometer thick mantle which includes granite, basalt, schist and sandstone. In fact, the mineral quartz is one of the most prolific lithic materials then available to prehistoric people for making stone tools. For this discussion, the range of quartz, based largely on diaphanous differences, include crystal, semi-translucent and opaque or milky, depending on the visual clarity of the specimen. The chemical composition of quartz (SiO2) is found in other stone tool materials such as jasper, chert, quartzite and chalcedony. Taken collectively, quartz and its constituent products was a principal material used to make projectile points and other cutting tools prior to the advent and development of metallurgy. The delicate conchoidal fracture pattern on some artifacts made from milky quartz can be difficult to trace - ask any lithic analyst who has worked with the stuff. Here in Pennsylvania, quartz was collected prehistorically from stream bottoms, floodplains, hillsides and other locations; wherever erosion managed to release the material from its bedrock source. Some sites were massive workshops. On such sites the land surface is littered with broken cobbles, cores and the telltale flaked debris from humans reducing quartz material to manageable size for transport elsewhere. Other sites consist only of a thin scatter of flakes and perhaps, one or two projectile points suggesting only a brief visit to the spot to hunt, re-sharpen tools or just as a place for the traveler to rest before moving on to the next camp. Quartz was used throughout the prehistoric cultural continuum, however, the lithic material was seemingly more popular during the Late Archaic, Middle and Late Woodland periods which may have been based on availability rather than cultural preference for quartz as weapons grade material. It is also likely that quartz was the preferred lithic type used for tool production when knapping points for certain tasks such as skinning and butchering animals because of its structurally close grained hardness where, in fact, other lithic materials might have failed. 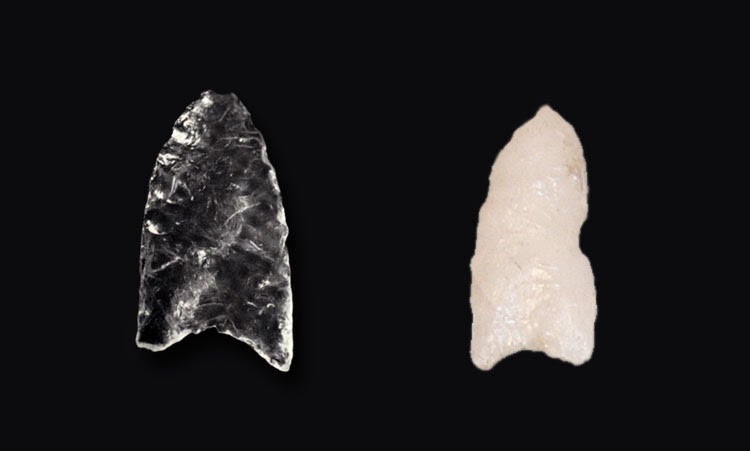 The following photos of projectile points and other quartz tool forms from the State Museum and private collections are provided for the reader’s benefit. These artifacts are from surface collected sites in the Susquehanna and Delaware drainages of southeastern Pennsylvania. We hope that you have enjoyed this brief presentation on the use of quartz and the many different stone tool forms fashioned from it. Please consult the For Additional Reading Section at the end of the blog for more information about quartz artifacts and how they were used throughout prehistory. Join us once again next time for another fascinating topic on Pennsylvania archaeology. “Save the Past for the Future”. 1999 The Geology of Pennsylvania. Special Publication 1. Pennsylvania Geological Survey and the Pittsburgh Geological Society. 2001 Classification Guide for Arrowheads and Spearpoints of Eastern Pennsylvania and the Central Middle Atlantic Projectile Points of Pennsylvania. Pennsylvania Historical and Museum Commission. 1996 Piney Island and the Archaic of Southeastern Pennsylvania. Pennsylvania Archaeologist 66(2):1-42. Continuing on the alphabetical trail of archaeology, this week TWIPA lands on the letter P. Since the conclusion of fieldwork at Fort Hunter this fall, the Section of Archaeology has been busy receiving a steady stream of cultural resource management collections from a variety of development projects including; Turnpike improvements, road realignments, bridge replacements, and a handful of natural gas pipelines. Another recent submission of artifacts to the museum is the result of a municipal office building project, and, for the purposes of this week’s post, is conveniently located in Philadelphia. Philadelphia is no stranger to urban archaeology. From the National Park Service excavations in the 1950s for Independence Mall, to major transportation corridor projects of the 1970s and 1980s, and still more recent projects like the Metropolitan Detention Center and the National Constitution Center, a great deal of the city’s archaeological heritage has been documented for the benefit of all Pennsylvanians and the Nation at large. Indeed, no fewer than 64 registered archaeological sites, most of them historic domestic sites, have been identified within a one mile radius of this particular project (Gall, et al 2012). In 2010, Richard Grubb & Associates Inc. was contracted to conduct an archaeological survey, evaluation and subsequent mitigation at the site of a new office building to be constructed for the City of Philadelphia’s Family Court House. 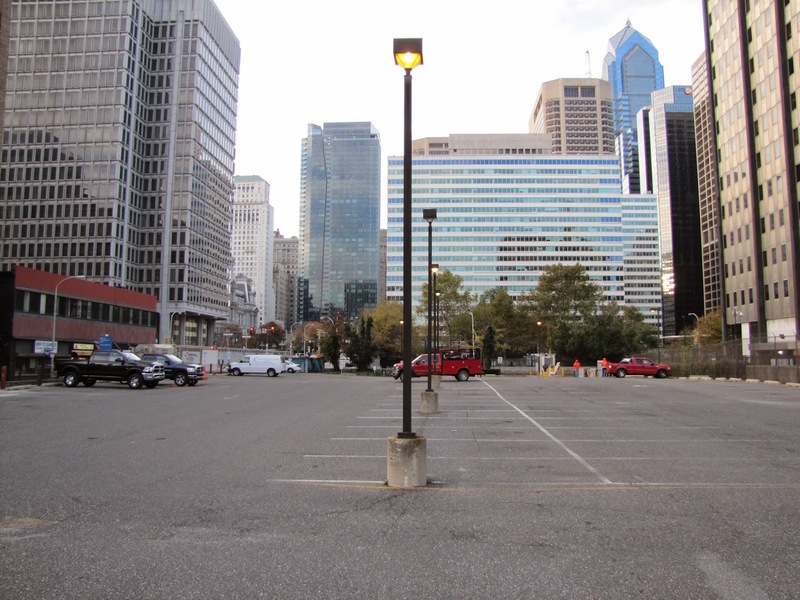 Located on the northwest corner of 15th and Arch Streets, the project APE, or area of potential effects, was at the onset paved with asphalt and being used as a parking lot. With the aid of historic fire insurance maps, portions of the project area were designated as having either high, medium, or low archaeological sensitivity, based on the presence or absence of basements of no longer extant buildings, and also areas where there is no record of any structures ever have being built. Accordingly, more resources were expended investigating areas identified as having high and medium sensitivity, although some sampling of low sensitivity areas took place as well. Trench excavations within the project area revealed a number of archaeological features that can be divided into two general categories. 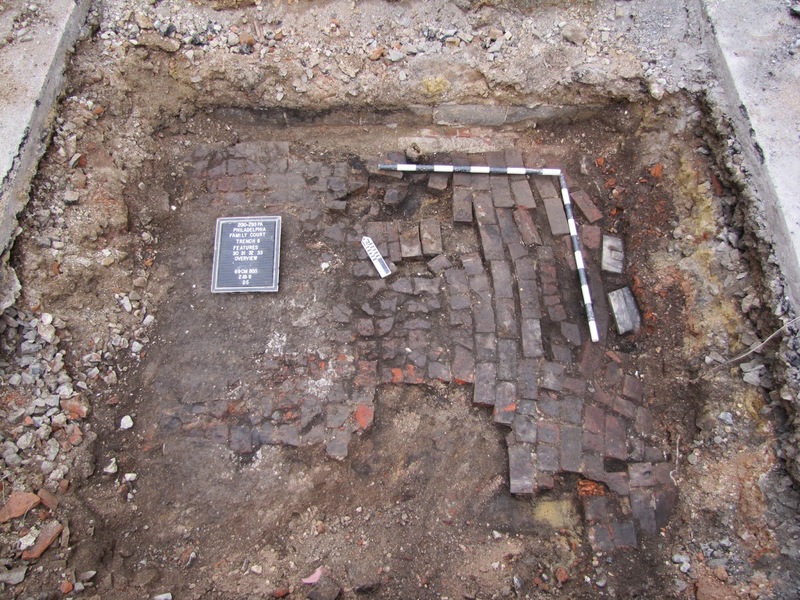 The first, are structural remains of former house lots dating from the early through middle 19th Century, and are represented by foundation walls, brick cellar floors, a fireplace, and shaft features including a well/cistern and brick lined privy. The second type of feature consist of the “buried A horizon” or the original historic ground surface containing slightly earlier late 18th through early 19th Century deposits along with associated sheet middens and refuse pits. 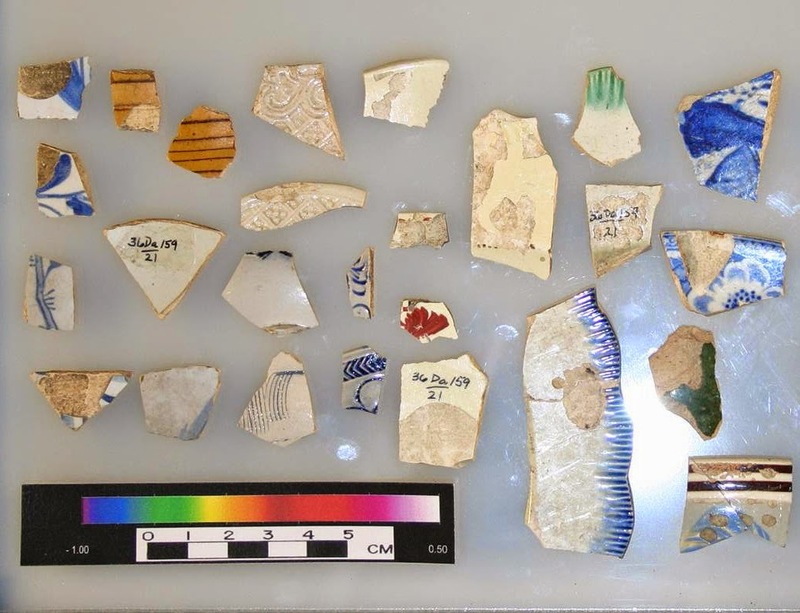 Of the over 35,000 artifacts recovered, nearly one half fall into the domestic category, including coarse and refined earthenware ceramics, glass tablewares and containers, and dietary animal bone. Another quarter of the finds consist of architectural debris such as large quantities brick and window glass, and lesser amounts of nails and roofing slate. Although the fewest in number, small finds and miscellaneous objects are often the most personal finds, and are therefore generally more interesting. 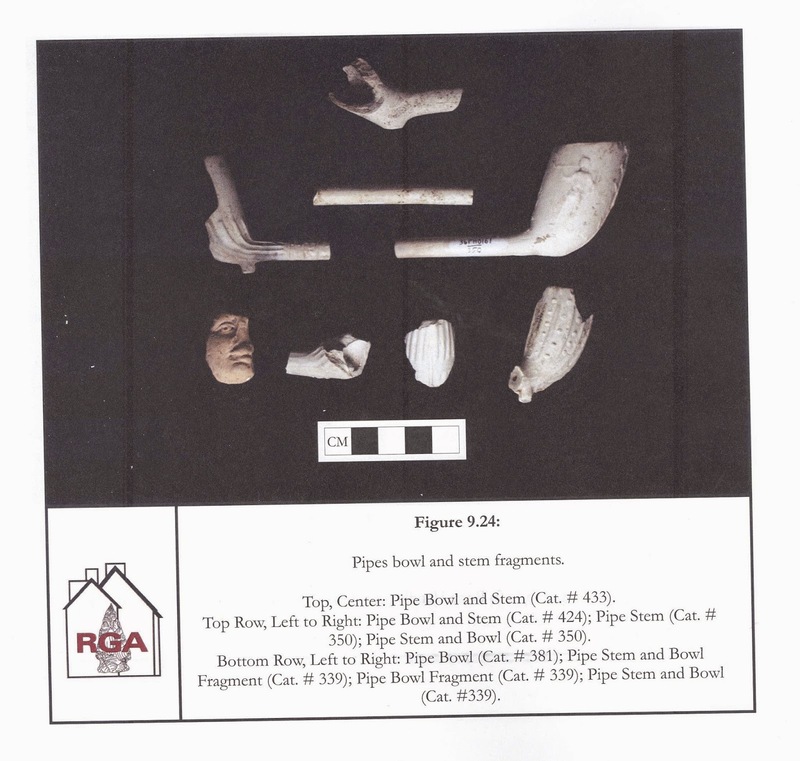 Examples from the site include a honey colored gun flint, a bone toothbrush fragment, an assortment of buttons and pins, and clay tobacco pipe fragments. Detailed review of the available historic documentation such as tax records, deed transfers and population census data was critical in enabling the archaeologists to reconnect the recovered artifacts to specific family groups of differing socio-economic status during the 1780s through the 1840s. The project area underwent drastic changes throughout its history, from pastoral land on the edge of the growing colonial city in the late 18th Century to residential and ultimately commercial use of the area through the late 19th and early 20th centuries. The archaeological excavation conducted for the Philadelphia Family Court House site and the analysis of the artifacts recovered offer a unique window into the changing lifestyles and consumption patterns of the inhabitants of this section of the city over time, and of the changing landscape of the city itself. Living on the Edge: Phase IB/II/III Archaeological Survey Philadelphia Family Court House 1501-1511 Arch Street City of Philadelphia, Philadelphia County Pennsylvania Richard Grubb & Associates, Inc.
Outreach, as defined by Webster’s Dictionary, is an important component to archaeology and one that we embrace fully here at The State Museum. Museums are considered educational institutions and one of our primary goals is to share archaeology with the public in a format that is clear and informative. If you have not visited the Anthropology and Archaeology gallery at the museum, or if it’s been a while, we invite you to come and learn about our rich archaeological heritage in Pennsylvania. Archaeologists have long involved the public in their work. In fact, archaeology in its early years largely consisted of enthusiastic, energetic, and knowledgeable members of the general public with a keen interest and passion about the past—a passion they readily shared with their local communities. Today, these knowledgeable individuals—who today we call avocationals—are still very much with us, even as archaeology has become more professionalized to meet the requirements of state and federal laws regarding the remains of past peoples. The word “outreach” is included in many of the agreements that federal agencies enter into before starting a construction project, and this outreach is a part of the archaeological studies that precede actual construction of highways, sewage treatment facilities or development projects. Archaeologists recognize that their outreach efforts are key to communicating with the general public as to why archaeology is done prior to construction in the first place. Outreach efforts help tie communities today with those that preceded them, giving them a sense of local heritage—a heritage that in some places goes back thousands of years with the American Indians that first inhabited Pennsylvania and continues through European colonization and the establishment of the United States. The forms that outreach can take are quite diverse. This blog, itself, is an outreach tool, but archaeologists also give lectures to the general public, run workshops that allow people to touch actual objects from the past and meet with those who do archaeology for a living. Many of these public programs are conducted during active archaeological investigations. Archaeological outreach can start with very young individuals, and many archaeologists work with teachers on the k-12 level. Archaeological outreach also harnesses the latest technology. Some archaeologists are using laser scanners to create 3D models of artifacts, for example, that can be printed in 3D by anyone, even from the comfort of their own homes. Digital archaeology, in one form or another, enables people from across the world to join together and appreciate Pennsylvania’s cultural heritage in a global context. The Section of Archaeology often features many of these outreach programs in our blog and an important event will take place tomorrow, November 8, 2014, with our Workshops in Archaeology program. The focus of this year’s program is Climate Change and the Archaeological Record. Many noted professionals will be presenting their research for the general public to understand how we examine the past to look for evidence of culture change, often tied to climate change. Walk-ins are welcome! We hope you have enjoyed this glimpse into the daily activities of our department and invite you to visit us at our programs throughout the year as we work to bring archaeology into our communities. Two weeks ago, the blog highlighted some of the more interesting artifacts recovered this season. Our focus this week is on several interesting features that have revealed more of the story of life during the 18th and 19th centuries in central Pennsylvania. According to my favorite archaeology text book by David Hurst Thomas and Robert Kelly, a feature is the nonportable evidence of technology; usually fire hearths, architectural elements, artifact clusters, garbage pits, soil stains, and so on. They are artifacts but they usually cannot be removed from the ground and can only be described. Fort Hunter was occupied by Europeans for nearly 300 years and contains a very large quantity of artifacts. Unfortunately, the majority of these cannot be dated unless found in features with other diagnostic objects – that is artifacts that can be chronologically placed to a specific and limited time period. Below we will review the more interesting and significant features encountered this season - some were datable and some were not. Feature 22/55 is a rock foundation that we first encountered in 2009 but misidentified as a French drain. As we expanded the area north of the well, it became clear that this feature was a building foundation. It consists of a mixture of mostly rounded cobbles but also some dressed diabase. Many of the cobbles were large, 12” – 18” in diameter. In this part of the site, it is possible to identify the original ground surface present at the time of European contact and the foundation seems to be resting on this surface. At the same level as the foundation or just below it, we uncovered numerous fire-cracked-rocks which were part of a Native American hearth feature to the east. It does not appear that a builder’s trench was dug for this foundation but rather the foundation was simply placed on the ground surface. The east wall of this structure is at least 15 feet long. As we expanded the block north, we carefully excavated around and beneath the rocks but did not find any artifacts that would suggest a date for when the foundation was constructed. Since it rests on the original ground surface, it could be early. This year we reached the back corner and were hoping to solve this problem. The back or north wall makes a right angle turn to the west. Unfortunately, the back wall ended within two feet where it had been cut by a waste water ditch or where a large section of the bank eroded away during the hurricane Agnes flood of 1972. To our dismay, what appeared to be postmolds turned out to be rodent disturbances and the artifacts found in them could have dated anytime during the 19th century. In the future, we will investigate the area to the west of the erosion ditch and hopefully, uncover the west wall of the foundation. Another feature that attracted our attention this season was Feature 24/48. This was a large hole dug adjacent to the well but it also extends to the north for approximately ten feet. It was first identified in plan-view in 2009 as a large circular stain adjacent to the well. Our excavation eventually extended to a depth of 6.6 feet and an iron pipe was found at the bottom that apparently was part of a pumping system for the well. Based on historic photos from the 1890’s, there was a windmill approximately ten feet to the west and it is assumed that it pumped water out from the well. This feature was not completely excavated because part of it extended into the west wall. During last winter, the adjacent unit to the north slumped and exposed more of the feature. While troweling the wall this year, we recovered the U.S. Navy button dating to approximately 1809. After the slump was cleared, approximately 15 inches of the feature was exposed in the floor and considering the date on the button, this required our attention. The button and several pieces of Middle Woodland pottery were the earliest artifacts found, however the majority were post 1850 in age and not particularly chronologically diagnostic. This portion of the feature was over seven feet in depth and revealed a mostly decayed log situated upright with an iron bar extending perpendicular through it. Most of the log had decayed but part was covered in creosote and therefore was preserved. Initially we speculated that the log was a wooden pipe that had been inserted into the ground. However, the iron bar suggested another scenario. Since the pipe connecting the windmill and the well are in the same excavation pit, we are now thinking that this log was part of this construction activity. In this scenario, the log was placed into the hand dug pit upright and the soil was filled in around it to secure it in-place. The log functioned as a “dead man” to which cables were attached to secure an adjacent structure; in this case most likely the windmill. We are reasonably sure that the windmill and pipe were part of the improvements made by the Boas family when they purchased the property in the 1870s. Therefore both structures probably date to that time. This does not help us much when interpreting the 18th century occupation but it does establish the construction chronology in this area of the site. Feature 77/90 is located at the back or north end of the icehouse. Originally, these were considered two separate features but after further excavation, they connected. The Feature 77 section is an 18” by 24” rectangular opening in the icehouse wall with a lining of motar on the bottom. The opening extends approximately two feet below the present ground surface and is approximately 6” below the current wooden floor of the icehouse. The opening does not extend inside the structure but is blocked by a dried laid brick wall. It is associated with a dark stain outside the wall that extended approximately 12’’below the plastered surface. Middle to late 19th century artifacts were recovered from both the opening in the wall and the dark stain area outside the wall. The Feature 90 section started out as a poorly defined stain extending north of the opening in the wall approximately 8 feet. It did not really take shape until the stain had been excavated to a depth of 8”. Rough cut wooden sides were exposed at this point with several long spikes protruding vertically from the sides. The spikes suggest that wood was attached to the top. It appears to have been a rectangular box extending from near the icehouse wall, north, possibly funneling water over the cliff that drops 36 feet to Fishing Creek. Depending on which records are accurate, the icehouse is either 15 or over 20 feet deep with stairs leading to the bottom. The records describe the ice as being stored on the bottom floor but, if the ice is stored on the bottom, why is there a drain at the top? Possibly the historic records are not accurate and the icehouse is not constructed deep into the ground and this feature acted as a drain for the melting ice. We have considered augering into the floor of the icehouse to determine its depth. However, augering inside a building would be very difficult since there is less than eight feet of roof clearance. The most productive feature we excavated this season in terms of 18th century artifacts was Feature 62. This was first identified in 2011. It appeared as a dark linear stain under the topsoil that produced a French gunflint and scratch blue salt glaze stoneware. This year, we recovered significantly more stoneware along with tin glaze earthenware. A preliminary analysis suggests these represent pieces of three or four vessels of scratch blue and at least two vessels of tin glaze earthenware. Unfortunately, these were found with 19th century artifacts. The stain was associated with a line of mostly dressed rocks but some rounded cobbles. It extended approximately 15 feet along the top of the slope leading down to the edge of the cliff overlooking Fishing Creek. 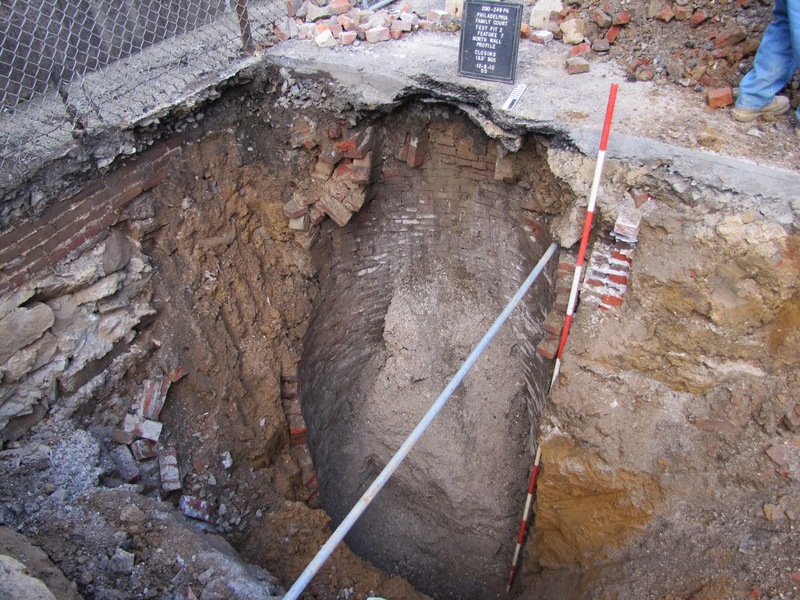 The 18th century artifacts were generally confined to a six foot long section but, it seems to have been part of a dumping area that was used well into the 19th century. Several pieces of the stoneware and the earthenware have been mended and it will be interesting to see if there are any re-fits from other parts of the site. For example, the area around the bake oven produced a considerable quantity of similar stoneware and they also might cross-mend. Feature 62 produced more 18th century pottery than we have recovered in many years at Fort Hunter, unfortunately all of it was from a mixed context. As is frequently the case, one of the most intriguing features was uncovered the last two weeks of the excavation. This is a circular rock foundation, 12 feet in diameter. Many of the rocks are large cobbles similar to Feature 22/55 but there is also a mixture of smaller cobbles and dressed pieces of diabase. However, in this case, there is a significant builder’s trench that is about 18 inches deep. The rocks do not appear to be aligned for a foundation but seem to have been disturbed. Possibly, the foundation was partially removed (robbed) to be used in some other structure. There also seems to be a small open ended rectangular structure on its north side. Artifacts are not common but most date to the 18th century. These include scratch blue stoneware, gunflint, musket ball and the near complete lock from a Brown Bess musket. Along with these early artifacts, the low density of artifacts also suggests that this is an early feature. Once Captain McAllister arrived in 1786, his artifacts became very common. Therefore, the low density of artifacts in this feature suggests a pre-McAllister structure. However, Feature 99 cuts through another feature that seems more recent, suggesting the foundation may not be as old as we think. The inside of the circle is disturbed but not to any depth so it is not a large well or cistern. We have discussed the possibly that it was one of the fort’s bastions or its powder magazine. However, a re-examination of historic records discovered that in 1798, there was an octagon shaped smokehouse in the back yard. It was elevated off the ground and smoke was produced via a stove on the outside of the structure – probably the rectangular structure to the north of the circle. However, the wooden smoke house was possibly constructed on top of a fort related structure. Clearly more excavation is required in and around the rectangular attachment and the features in the center of the rock circle. This feature will be a focus of our activity in the fall of 2015. Although, this season produced a relatively high frequency of 18th century artifacts, some of which may be fort related, with the exception of the hillside dump, all of these features could date to Archibald McAllister’s occupation rather than the French and Indian War fort. The features have also given us direction for excavation in the future. Practically all of these features are examples of the mystery and frustration involved in archaeological field projects. We spend considerable time in the excavation of features but their function and age frequently remain problematic. 2007 Archaeology Down to Earth. Thomson Wadsworth Publishing, Australia. As we wrap up our time in the field at Fort Hunter Mansion and Park, we have found limited structural evidence of the French and Indian War era fort. Though we have not found structural evidence of the fort, we have found a number of artifacts, some that date to the French and Indian War period and some that do not. One of our more exciting finds this year is the “lock” mechanism of a Brown Bess musket. Brown Bess muskets were in service of the British Army from the early 1700’s to the early 1800’s. At the beginning of the war, which began in 1757, it is said that there were approximately 80 soldiers at the fort, but this changed dramatically when it was discovered that the majority of the war would be fought in the Ohio River Valley. Due to this realization the use of the fort became primarily for supply. At this time the fort was manned by much fewer men, approximately 30, who were a militia made up of local farmers and residents. These militia men would have provided their own weapons, which may have included a Brown Bess gun. This suggests that the gun part, which seems to have been discarded after breaking, could have been used by one of the Fort Hunter French and Indian war era men. Other military-related artifacts found this year include two musket balls and a French gun flint. Though we cannot be sure these objects are from the French and Indian War era, it is possible. Since the fort was manned primarily by a militia and they would have provided their own weapons, the different sizes of muskets balls and various types of gun flints found throughout the years of excavation at Fort Hunter can be explained. These militia men would not have all had the exact same weapons as an army would have had. Another interesting artifact that was found this year and in our excavations in past years is a datable ceramic called Scratch blue. Scratch blue is an English salt-glazed stoneware that was created by incising deep lines in the ceramic body and filling it with cobalt blue oxide before firing leaving thin blue lines in generally floral motifs after firing. This type of ceramic has a very narrow production date range of 1744-1775. This date range includes the French and Indian War period, suggesting that these ceramics may have been used by the soldiers or militia men of the fort. Of course, most of the artifacts, including the Scratch blue stoneware, the gun flints, and the musket balls could have been used by the occupants of the Fort Hunter land during much of the 18th and 19th century. As mentioned in previous blogs, the use of the land surrounding and including the Fort Hunter Mansion and Park extends far back in time. Just this year we have found a number of flakes left behind by prehistoric Native Americans. In our last week in the field one of our interns, Tessa Burns, was lucky enough to find an intact datable prehistoric artifact. This artifact is an Otter Creek projectile point. Just last year we found another Otter Creek point and this year’s find reinforces the idea of a long history of land-use here because Otter Creek points date between 5800 and 6600 BP. So here we are, another field season complete and, though we still have not found the fort at Fort Hunter, we have continued to add to our knowledge of the long history of the land-use at the Fort Hunter Mansion and Park. Thank you to all of our volunteers for dedicating their time and efforts in helping us in the field and thank you also to all those who took the time to stop by and listen and learn about archaeology and what we have been doing at Fort Hunter for the past 8 years. 2006 Baker Rifle. Electronic Document, http://www.historyofwar.org/articles/weapon_brown_bess.html. Brown Bess – Musket Misconception. Electronic Document, http://www.concordma.com/magazine/janfeb02/brownbessmusket.html. Coinciding with our archaeological tribute to the letter “M” and our third week of excavations at Fort Hunter Mansion and Park this year, we will focus on small things forgotten and the McAllister family who owned and lived on the property from the mid-1780s to 1870. This era marks a turbulent time in early American history, from the forming of the Nation to the first years following the Civil War. Along with historical documents, the archaeological record left behind by the McAllisters reflects a period of dynamic change in frontier economies, the impact of slavery on the farming industry in central Pennsylvania, as well as the day to day hardships of life in the 19th century. Captain Archibald McAllister (b.1756, d.1831), purchased what is now the park land and adjacent areas as a young man with a growing family in the mid-1780s. The son of Colonel Richard McAllister, a prominent civic leader, military figure and the founder of Hanover in the then undefined boundary between the colonies of Maryland and Pennsylvania, Archibald continued in his father’s footsteps. Both men served in the Continental Army during the Revolutionary War, and encouraged the settlement, development and growth of the Commonwealth’s south-central region throughout their lifetimes (Dickson, 2000). Fort Hunter was an abandoned French and Indian War period fort (1755-1763), and the location of a farm with adjoining grist and saw mills when Captain McAllister purchased it in 1787 after living as a tenant on the property for several years. Over the course of the McAllister family stewardship, the land was transformed into a “self-sufficient frontier village". Many of Captain McAllister’s architectural improvements to the property are still maintained by the park—the stone constructed Federal-style front (1814) and central (1786) portions of the Mansion, and the ice house (1790s) directly behind. Some of these structures have undergone renovation as subsequent owners’ updated facilities, but original early nineteenth century features still remain of McAllister’s Tavern, The Practical Farmer (circa 1800), attached stone stable with an English-style drive-through barn (1810) and spring house (circa 1800), speculated to have housed the distillery. (Dickson, 2000; Fort Hunter park walking tour brochure).The original milk house, also known as McAllister’s Dairy, no longer stands, but is reconstructed in the back yard of the Mansion in its approximate location. It was regaled for its many innovative features in 1835 issue of “The Cultivator” by an impressed visitor recollecting an 1828 outing and tour of the Captain’s grounds (Chronicler, Spring 2011). Yearly excavations at Fort Hunter since 2006 have uncovered evidence of other out-buildings and structures buried just below the surface that may date to, or were restored and used during the McAllister era. East view of back yard ice house and 2006 excavation block with subsurface cut stone platform visible tothe upper left and eighteenth-nineteenth century bake oven feature also exposed below the topsoil. This year we continue to investigate around the ice house behind the Mansion. A cut stone platform, possibly indicative of a former structure, was first uncovered on the side of the icehouse during 2006 excavations. We continue to record its perimeter to determine its function as our excavation block expands to the northeast. Last week staff archaeologist, Jim Herbstritt, directed Franklin and Marshall students,opening investigation units on the north side of the cut stone feature discovered in 2006. Previous postings have speculated that the well found adjacent and constructed along the west side of the ice house, was potentially dug in the 1750s to service the men stationed at the fort.Due to the well’s close association with the ice house and the lack of datable evidence to suggest otherwise, it was most likely improved upon substantially or constructed entirely under Captain McAllister’s oversight shortly after the purchase of the property. Cultural deposits of artifacts found during the careful excavation of the bake oven southeast of the ice house would further suggest that this structure too, if originally built during the Fort period, was restored and in continual use for almost the entire 90 years of the McAllister family residency. A 1798 Direct Tax record lists a wooden smoke house among Captain McAllister’s improvements to the property (Dickson 2000). This subsurface feature of highly oxidized soil and burnt organic material, filled with butchered bone and eighteenth and nineteenth century pottery is a likely location for this structure. along with a copious amount of animal bone……. While our project goals and the scope of our excavations have not focused on finding the material culture of African-American household members or their quarters, these individuals farmed the land, served the McAllister household and performed domestic duties. They built and maintained the facilities, and managed and worked the various industries undertaken by the proprietor—“grist and sawmills, country store, blacksmith shop, school, artisan’s shops, tavern and distillery”. Their lives are as much a part of the story of Fort Hunter as the McAllister family members. Captain McAllister and second wife, Elizabeth had six children who grew up in the home and participated in the day to day operations of the property. His third son, John Carson McAllister (b.1790) inherited the estate and ran the property until his death in 1866. Archibald, Elizabeth and John are all buried in the family cemetery located on land east of the park. (Dickson 2000; Weis 2010). Excavations this year have uncovered a personal item of Captain McAllister’s second son, Thomas Gates McAllister. Thomas, born in 1784, spent the formative years of his short life at Fort Hunter, dying of a protracted illness, five years prior to the addition on the Mansion’s front section. Thomas Gates McAllister’s “Double Gilt” brass naval button with thirteen stars surrounding emblem, circa 1805. The Continental Navy was disbanded after the Revolutionary War, but was reinstated by Congress in 1798. Buttons of this period display an American eagle standing with head to its left and a lined oval encircling a fouled anchor on the eagle’s right. A circling ring of stars was added in 1802. (Hughes and Lester 1981: Plate 307:38 and 40, p. 718; Emilio 1911: Plate 1:26, p.7). In 1805, Thomas was commissioned into the navy as a surgeon’s mate or acting surgeon where he served consecutive tours of the Mediterranean stationed on the James Adams, the Constitution, and the Enterprise (McAllister, Thomas Gates, diary 1805-1807; link below to PHMC Archives). His service was cut short by a chronic illness and he was returned stateside to a Washington D.C. military hospital in 1807, too weak to write home. A friend of the family happened upon Thomas and arrangements were made for his return. He convalesced for the last two years of his life at Fort Hunter, eventually succumbing to a debilitating disease. Captain McAllister wrote a month before his son’s death at the age of 24, “he continues extremely ill. His limbs are so contracted that he is drawn as it were in a lump. If ever he should recover, I am afraid he will be without the use of his limbs: his knee joints are out of place, also his ankle. You would think it impossible for [a] human being to have life and have so little flesh as he has (January 23, 1809).” (McKee 1991). foundation that may date to the McAllister era or before. The remains of past structures and the restoration and conservation of historical buildings chronicle the passing of time and the evolving needs of running a profitable farm and merchant business in the late eighteenth through nineteenth centuries at Fort Hunter. Personal items, when found, provide a direct link back to the individuals, who profited, suffered, lived, loved and lost, reminding us how deep and rich our history is. The McAllisters left many documents to assist future generations in understanding who they were and how they lived. Archaeological investigations at Fort Hunter round out this picture, clarifying details that were not carefully recorded and providing greater insight into the lives of the McAllister household, the laborers and servants, both free and enslaved, who are under-represented in the historic record. Special thanks to our daily volunteers and all who participated in Fort Hunter Day last Sunday. It was a highly successful event with over 3000 visitors stopping by the excavation. The education experience continues through October 3rd (Mon-Fri, 9am to 4pm). Come on out and see us! 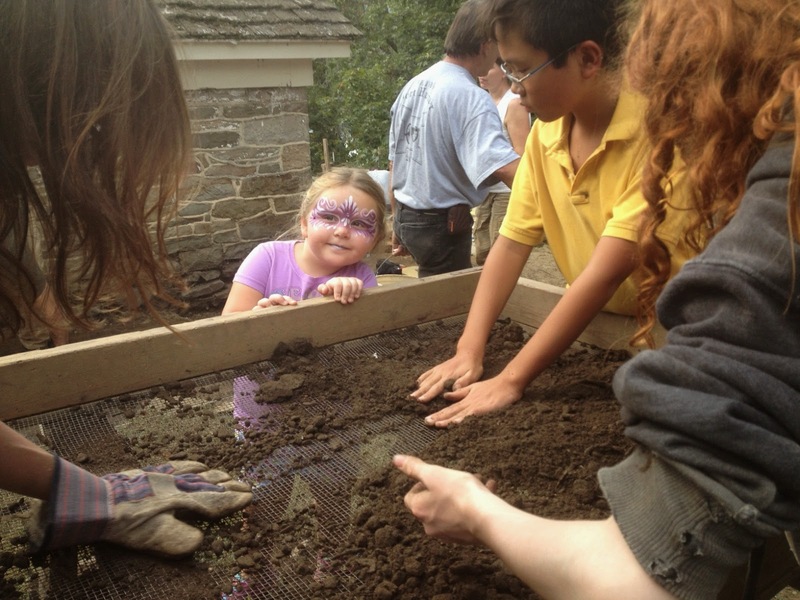 Budding archaeologists screen for artifacts during Fort Hunter Day festivities. 2000. The Fort Hunter Story: A microcosm of American History. Masters Thesis. The Pennsylvania State University at Harrisburg. 1911 The Emilio Collection of Military Buttons: American, British, French and Spanish, with some of other Countries, and Non-Military in the Museum of the Essex Institute, Salem, Mass. The Essex Institue. Salem, Mass. Spring 2011 Vol 32:No.1. The Friends of Fort Hunter Inc, Fort Hunter Mansion and Park. 1981 The Big Book of Buttons: p.718, Plate 307. 38. Boyestown, PA. Boyerstown Publishing Company. January 23, 1809 Columbian Centinel (Boston). 1991 A Gentlemanly and Honorable Profession: The Creation of the United States Naval Officer Corps, 1794-1815. Annapolis: United States Naval Institute. http://forthunter.org, see also Fort Hunter walking tour downloadable brochure, Dauphin County Parks and Recreation. 2002 Fort Hunter Mansion and Park: A Guide. Mechanicsburg, PA: Stackpole Books. 1989 Descendants of Archibald McAllister, of West Pennsboro Township, Cumberland County, Pa, 1730-1898. Harrisburg, PA: Schaeffer's Printing and Bookbinding House.